Marvel Two-in-One #92: This Evil Returning..! Bashful Benjy is in Egypt, where he's arranging for transportation back to New York after the events of last issue. After a few minor problems with too small metal detectors, a lack of identification, and some hijackers who picked the wrong plane, he's on his way home. Back in New York, Jocasta has come to the Baxter Building for help with her malfunctioning cybernetic senses. While Reed investigates the problem, Jocasta and Alicia strike up a friendship, and Jocasta is invited to Alicia's sculpture show the following day. Ben has arived back in New York during all this, and the following day Reed sends him off to explain the destruction of the Pogo Plane to the insurance company. His insurance investigator is Aaron Stack (a.k.a. Machine Man). During Ben's meeting, Jocasta goes berserk at the sculpture show and races off. Ben gets beeped and goes off to help, telling Aaron he "has to go help a lady robot friend." Machine Man is intrigued for obvious reasons, and decides to investigate as well. Using his enhanced abilities, Machine Man is able to track Jocasta more quickly than Ben is, and MM finds her at an abandoned plant just after she finishes resurrecting... Ultron. Once he is resurrected, Ultron's hypnotic control over Jocasta ends, and she and Machine Man face off against Ultron. The Thing arrives outside the plant just in time to hear the fighting starting inside. This is the first part of a two-part story that concludes next issue. Ultron... If you don't know who Ultron is, I'm not quite sure why you're reading a Marvel Universe web page. Ultron is a robot dedicated to the destruction of all organic life. His last appearance (in Avengers 202) left him trapped in a pool of adamantium like a fly in amber, which is where we find him in this issue. As an interesting aside, that issue of Avengers was adapted from a Jim Shooter short story ("This Evil Undying") which appeared in a 1979 paperback titled "Stan Lee Presents The Marvel Superheroes, featuring The Hulk, The Avengers, The X-Men, and Daredevil." After this appearance, he does not appear again until the Beyonder resurrects him for Secret Wars. One of the signs being held by some protestors outside JFK International Airport: "Bring Back Stan Lee!" Page 10, panel 4. Yes, yet another mention of the classic Avengers poker game that Benjy regularly takes part in! As Aaron Stack, Machine Man muses about Ben, "When last we met, the encounter was anything but pleasant!" 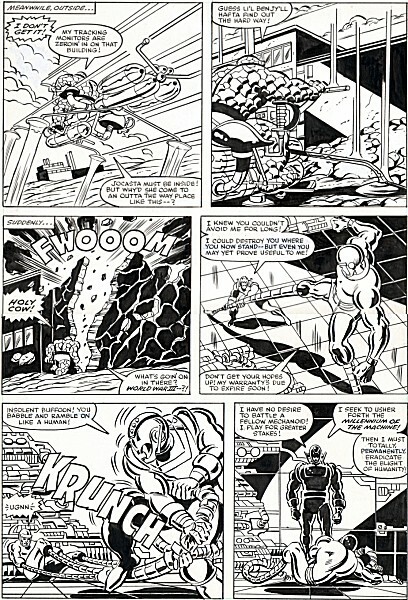 In Machine Man 15, Machine Man broke into the Baxter Building as part of an effort to help save a woman who had been transformed into a gaseous form (called "Ion"). MM ended up fighting both the Human Torch and the Thing. Original art from your editor's collection. While I really would love to see Jocasta in here, hey, we do get Ben's flying bike. Plus... Ultron at his most melodramatically generic. Here is a set of reviews of these two issues from an Ultron-centric perspective.